We recently announced our latest callout for Unlimited Awards 2019. Last round, we partnered with Wellcome to grant a Research and Development Award. This time, we have extended this partnership model to include five different organisations, to make a range of Commissions and Research & Development Awards available. Unlimited Project Manager Clara Giraud tells us more about these awards and the opportunities they create. One of the key objectives of Unlimited is to encourage the embedding of ambitious, high quality work by disabled artists and companies in the wider cultural sector. 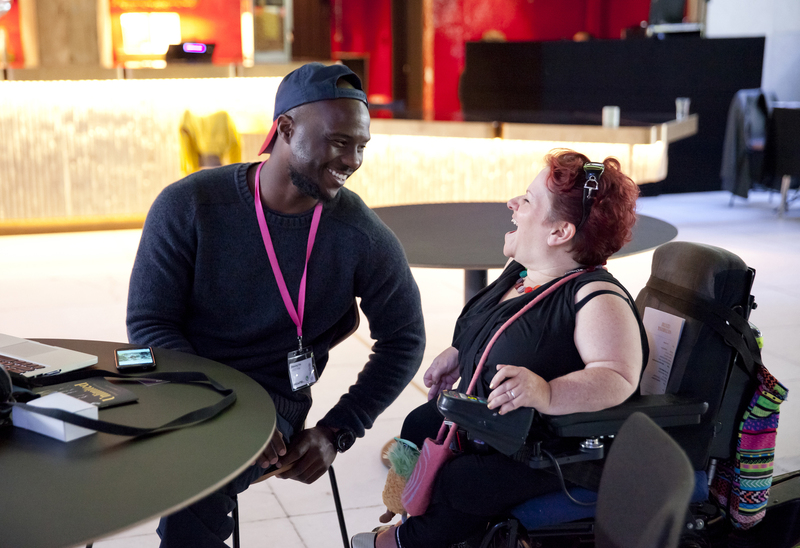 Working closely with a diverse range of organisations that not only present work by artists but also support development and creation is a way for us to ensure a deeper impact for Unlimited, to embed inclusion at the heart of our working process. We’re excited to be working with five organisations that offer a range of scales, contexts, audiences, expertise and networks across artforms. Partnering with these organisations allows us to offer more awards, and to add to our open callout for established artists and companies. It means we can offer some awards with specific briefs for artists to respond to – which we know some artists prefer. And it also means we increase the amount of funding available. From an original grant amount total of £350,000 to offer to artists and companies, we now have over £70,000 in additional funding making our total budget in excess of £420,000. But it’s not all about money – our partners add value in many ways, including in relation to form. These Partnership Awards encourage artists to consider stretching their practices in specific directions: developing a sculptural piece for a forest context (with Forest of Dean Sculpture Trust), shaping a project in response to hospital patients and staff (with GOSH Arts), re-examining the notion of rural touring by exploring the potential of village halls and communities (with Farnham Maltings), challenging what cross-disciplinary might mean (with Forma), and delving into the world of biomedical research (with Wellcome Collection). Remember, there is a change this year. Artists and companies choosing to apply to Unlimited can submit up to two proposals, providing either one or both of these is aimed at a Partnership Award. All proposals, regardless of whether they are applying to a Partnership Award or not, will be considered for the Main Unlimited Commissions and R&D Awards, respectively – applicants are not reducing their chances of gaining funding by applying to a Partnership Award. We’ve updated our FAQs with some questions and answers linked to these Partnership Awards, these might give you a greater insight in the opportunities on offer, and help you decide if your project might be right for them. The deadline for Expressions of Interests across all strands is 29 October 2018 at 12 midday. Full information on how to apply here.